More than 60 parameters are routinely measured in serum, plasma or saliva, and metabolites can be assayed in urine, including steroids (androgens, oestrogens, glucocorticoids, mineralocorticoids), peptides (ACTH, ADH, C-Peptide) and proteins (gonadotropin, prolactin, TSH, GH, HCG, insulin) for the investigation of the function of all endocrine glands, including the thyroid, the gonads, the pituitary gland, the adrenal cortex, the pancreas and the placenta. Other tests investigate glucose metabolism and growth. These investigation also extend to the determination of auto-antibodies (against the thyroid, insulin, GAD-65, IA2, etc.) and transport proteins (Testosterone-Oestradiol Binding Globulin, IGF-BP3, IGF-BP1). These assays can help with the diagnosis and therapeutic monitoring of diseases that are caused by impaired endocrine function, e.g. male and female infertility, premature and delayed puberty, hypogonadism, growth disorders, female hyperandrogenism and hirsutism, high blood pressure, dysthyroidism and diabetes. Eurofins Biomnis is of course committed to providing results with the best possible turnaround times. 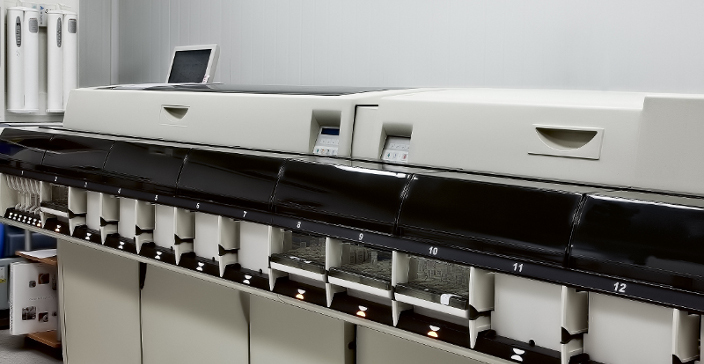 To this end, many tests are analysed on high-capacity automated instruments. However, we are also committed to providing the most accurate possible results, and we therefore use, for each analyte, the best possible method. Steroids in the blood, urine and saliva continue to be measured by radio-immunoassay (sometimes after extraction with or without chromatography) or, for conjugated species, by hydrolysis. Most peptides and glycoproteins are also assayed using usually direct immunoradiometric methods.